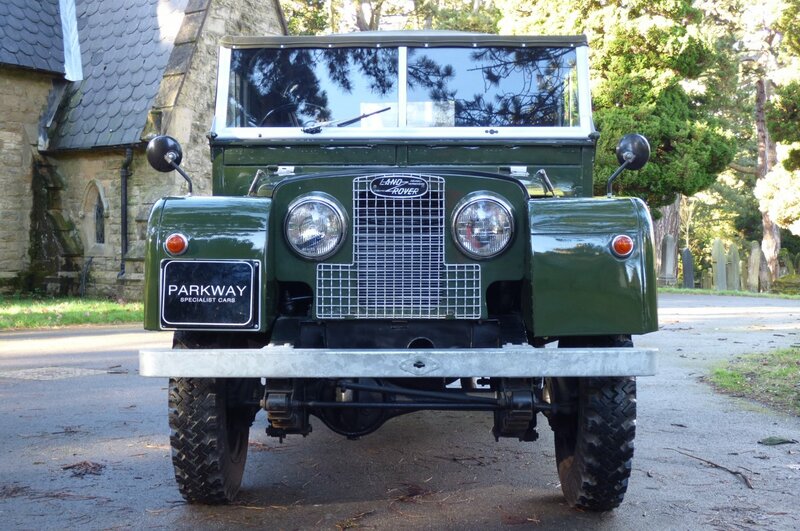 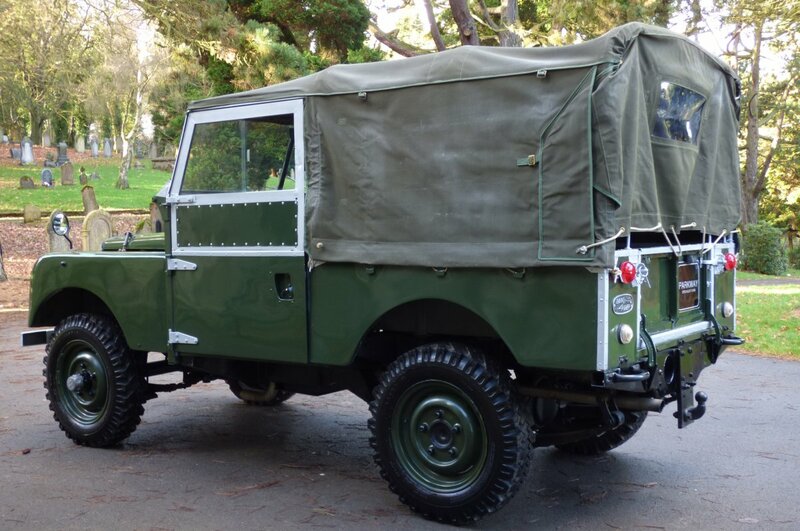 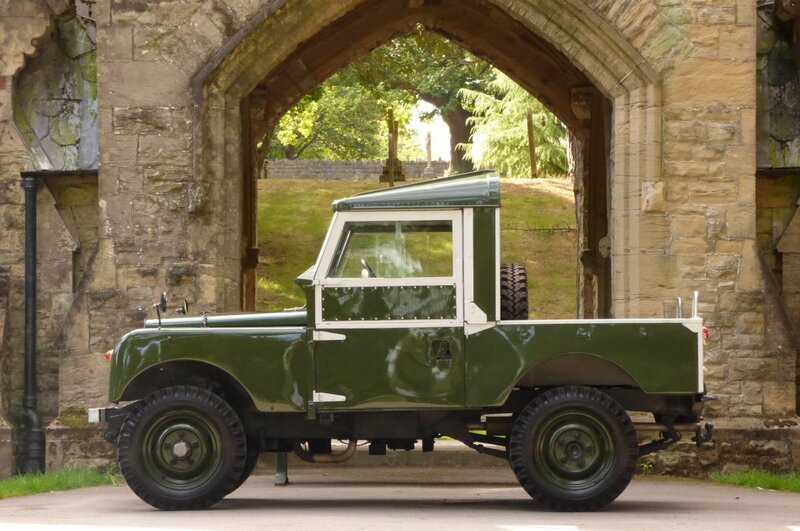 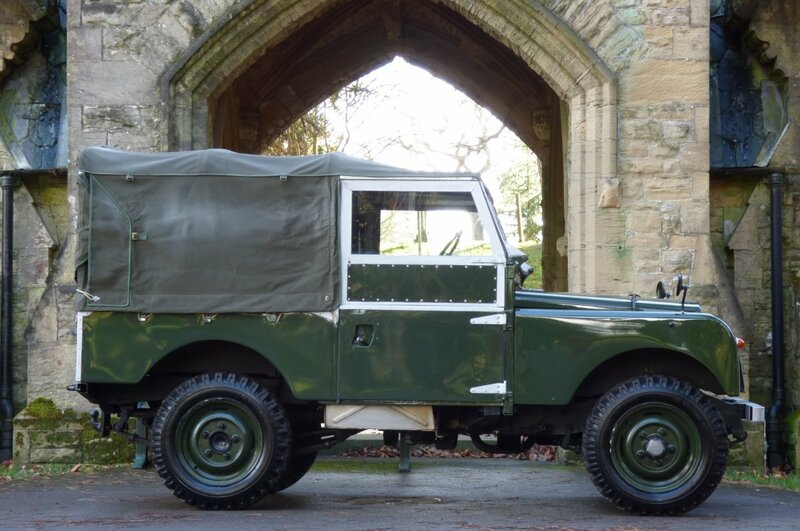 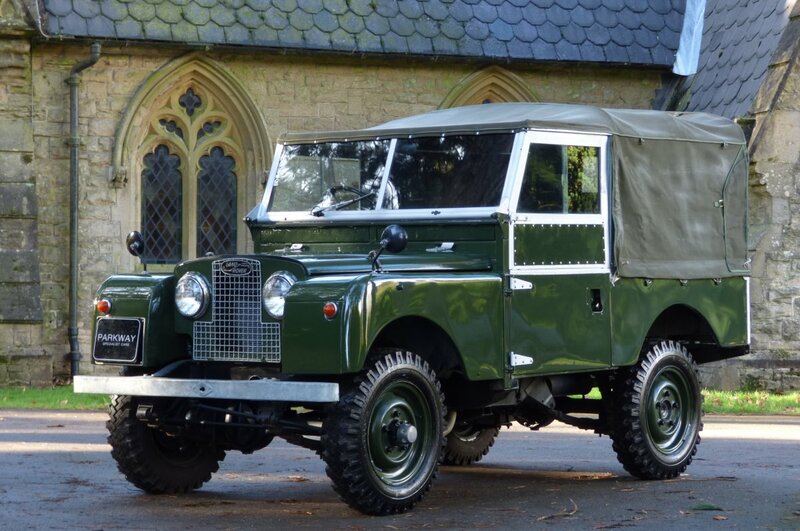 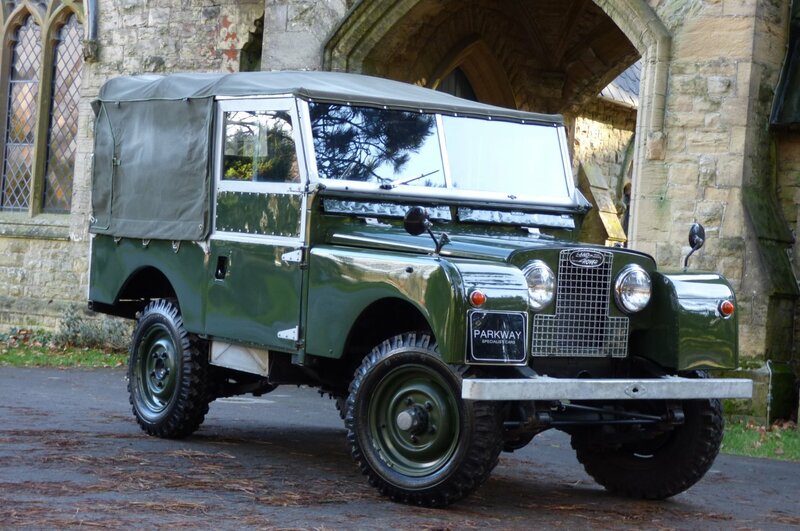 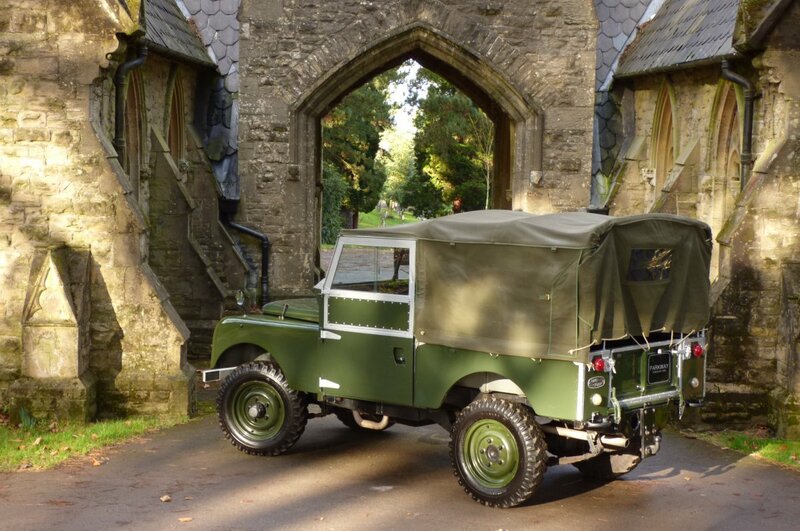 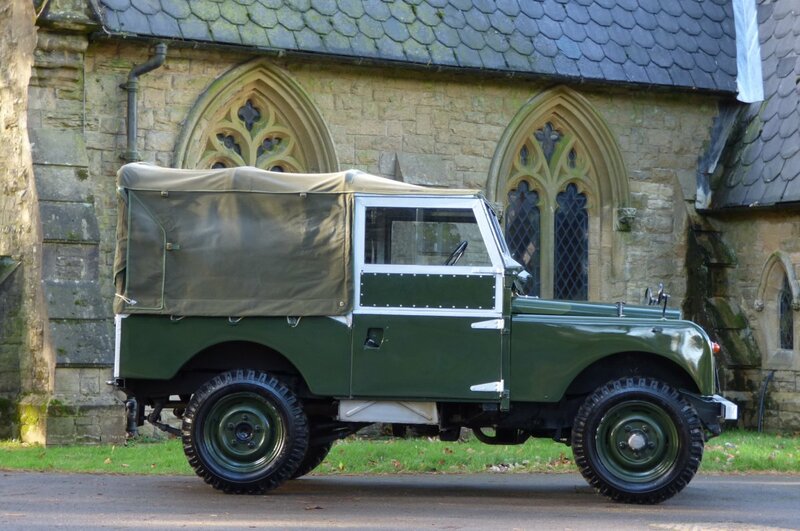 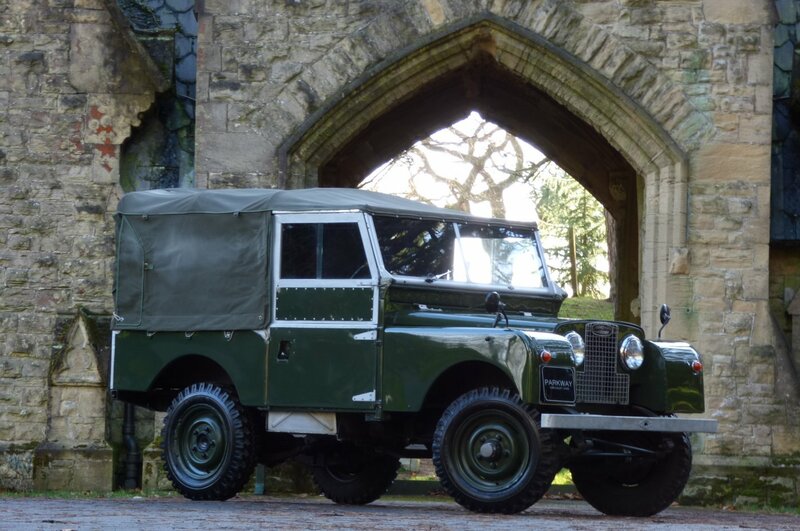 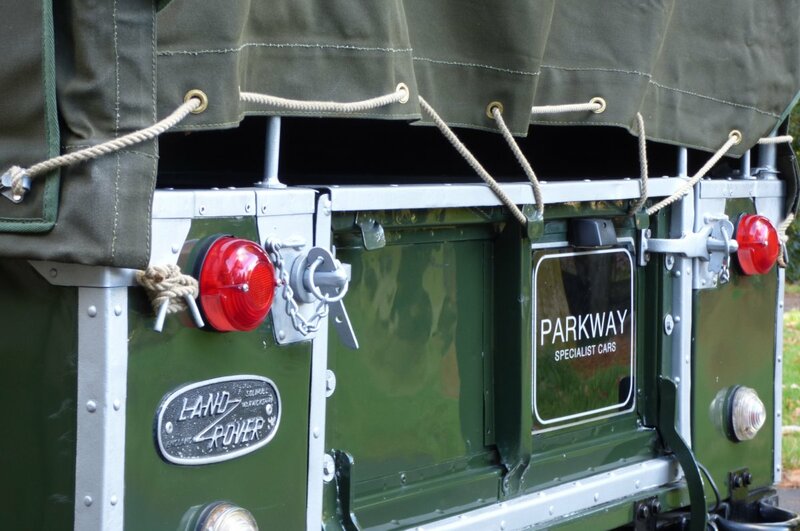 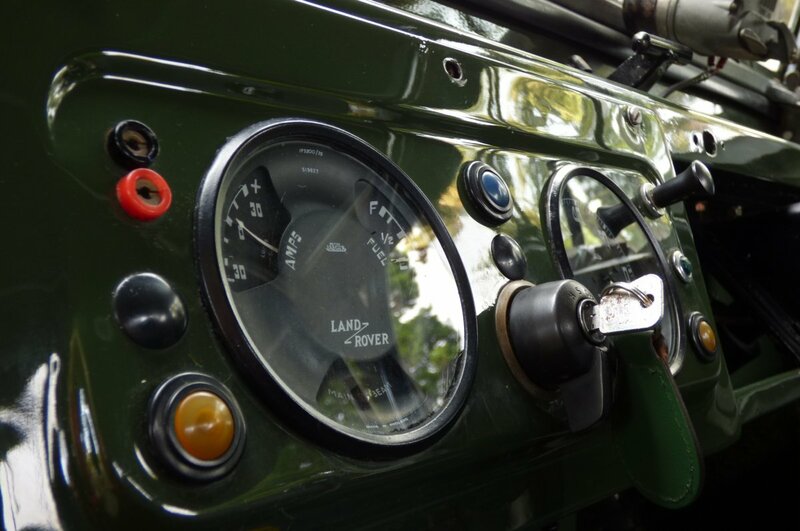 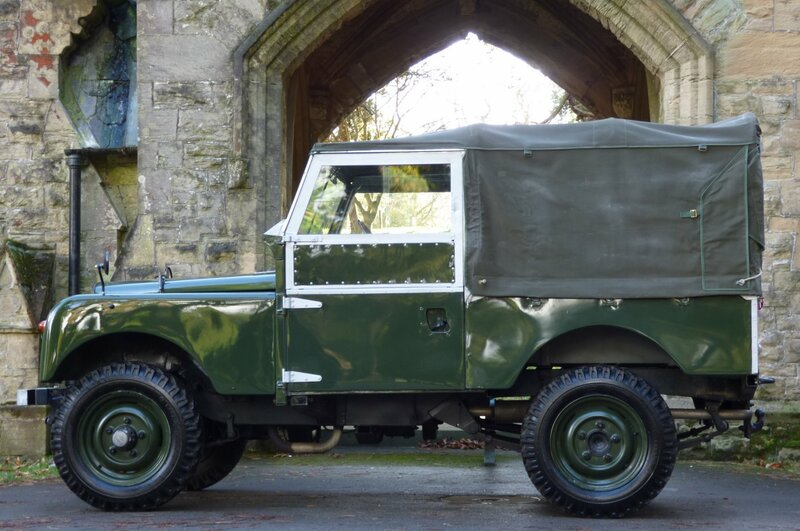 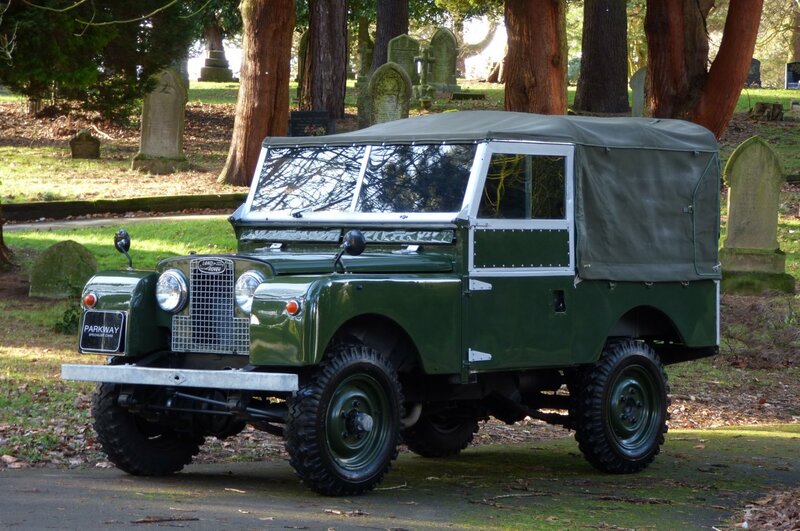 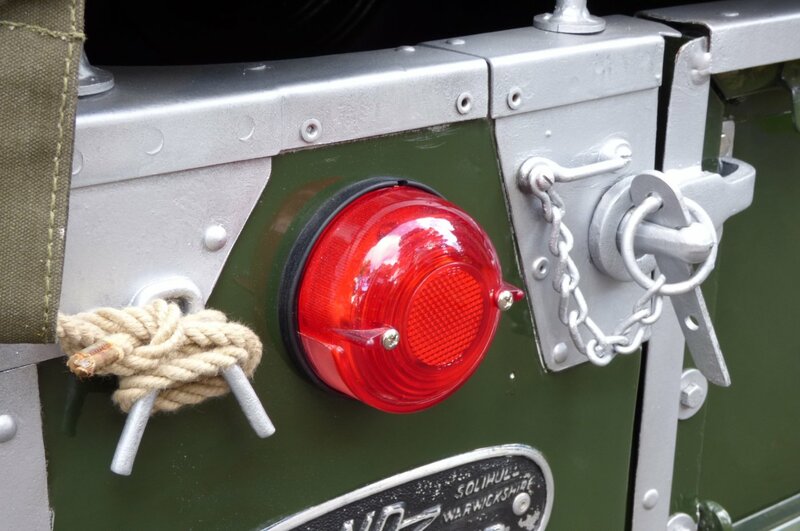 Land Rover Entered Production In 1948 With What Has Later Been Termed The Series I. 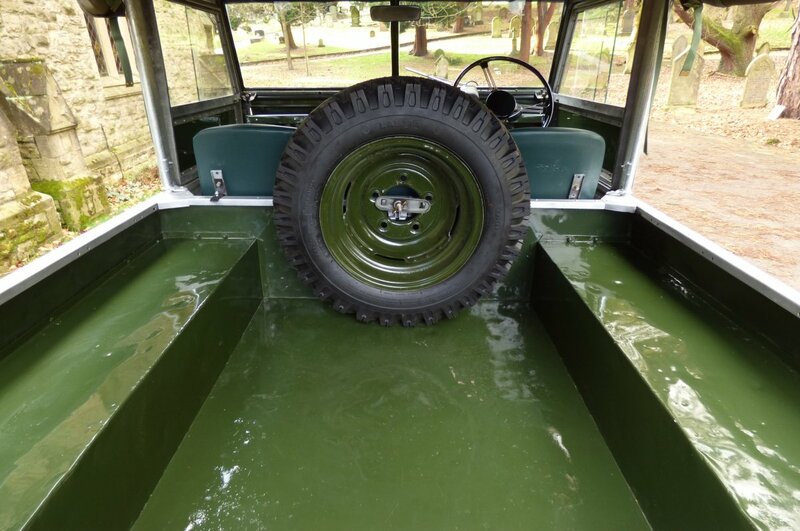 This Was Launched At The Amsterdam Motor Show. 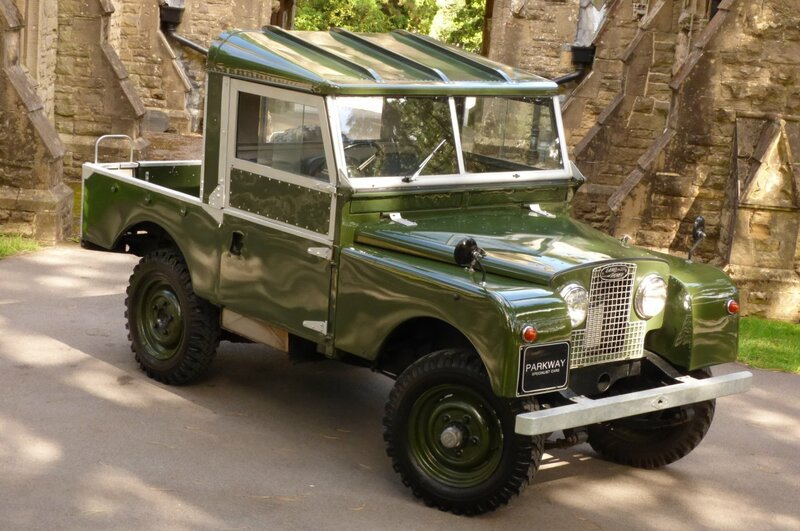 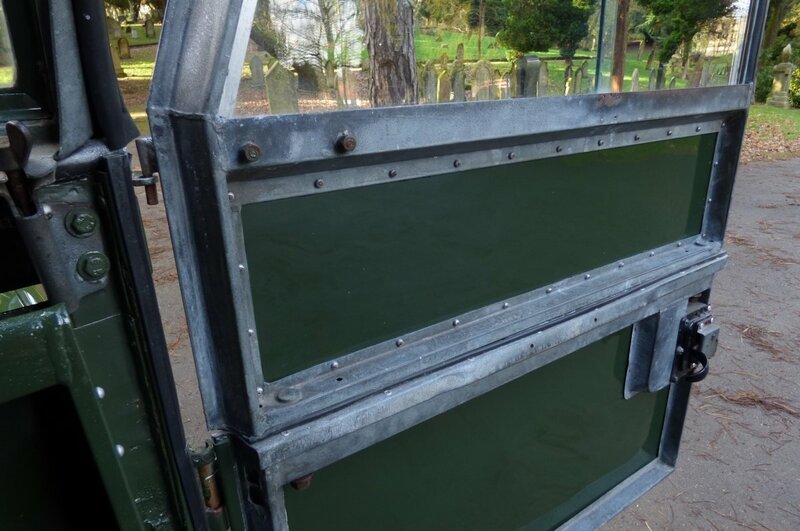 It Was Originally Designed For Farm And Light Industrial Use, With A Steel Box-Section Chassis And An Aluminium Body. 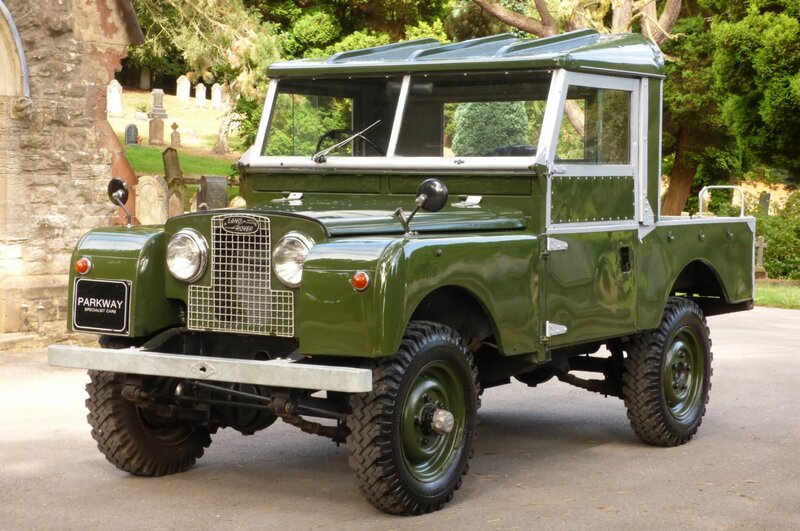 Originally The Land Rover Was a Single Model Offering, Which From 1948 Until 1951 Used An 80-inch (2.03 m) Wheelbase And A 1.6-Litre Petrol Engine Producing Around 50 bhp (37 kW; 51 PS). 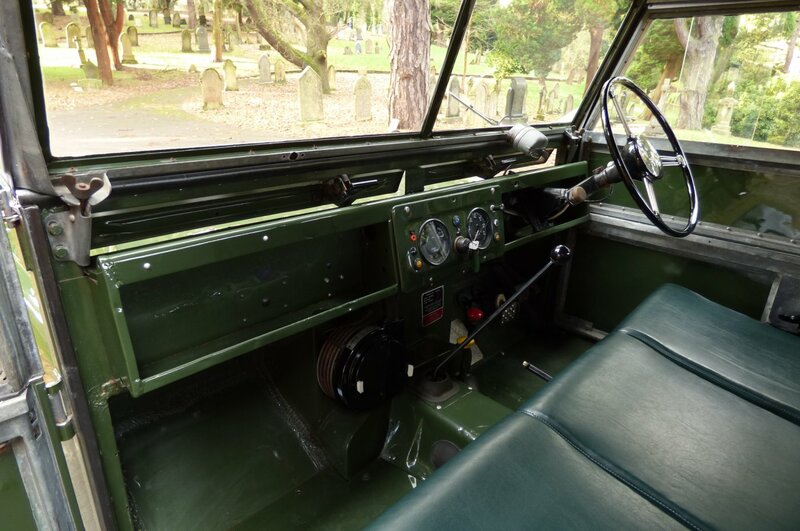 The Four-Speed Gearbox From The Rover P3 Was Used, With a New Two-Speed Transfer Box. 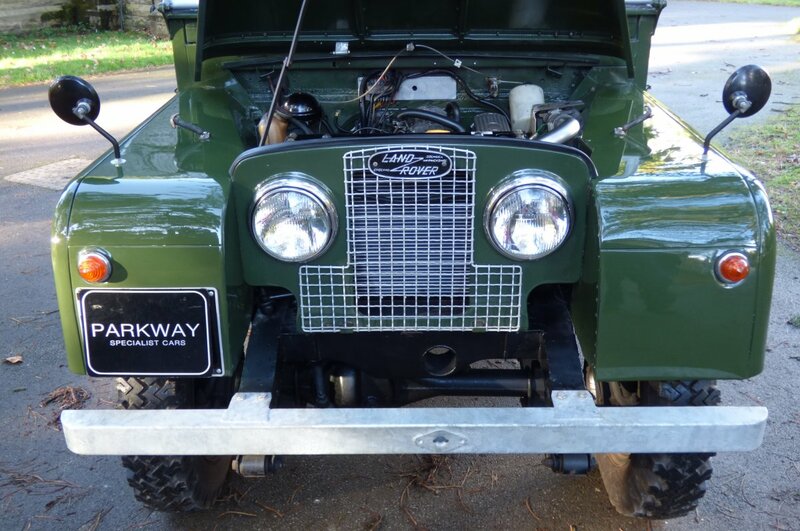 This Incorporated An Unusual Four-Wheel-Drive System, With A Freewheel Unit (As Used On Several Rover Cars Of The Time). 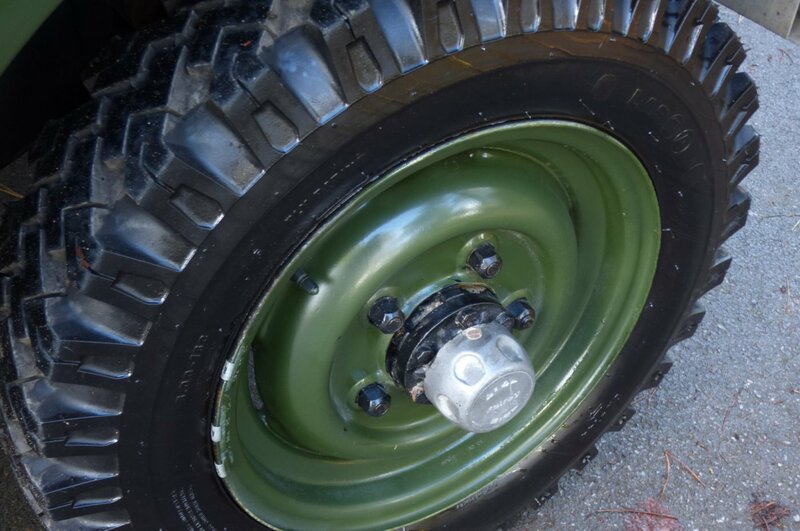 This Disengaged The Front Axle From The Manual Transmission On The Overrun, Allowing A Form Of Permanent 4WD. 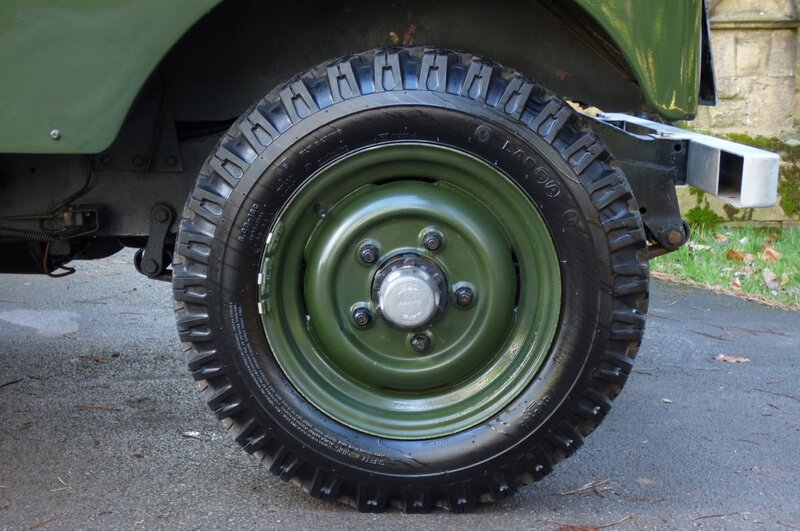 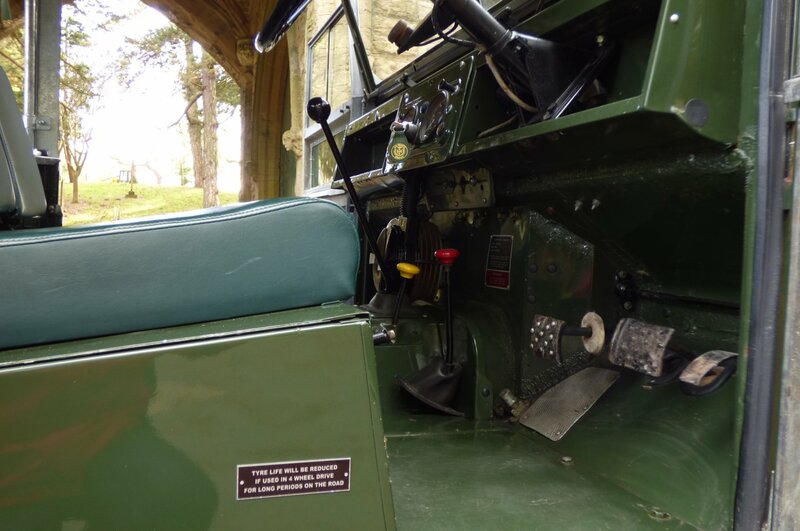 A Ring-Pull Mechanism In The Driver's Footwell Allowed The Freewheel To Be Locked To Provide More Traditional 4WD. 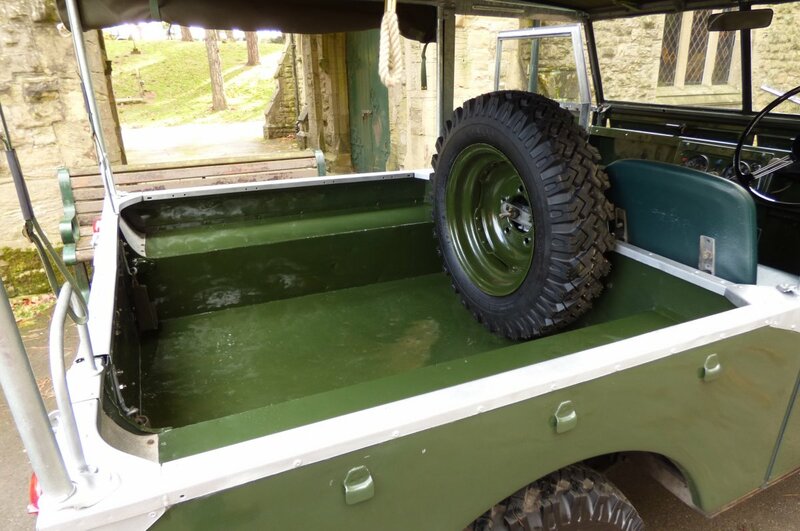 This Was A Basic Vehicle: Tops For The Doors And A Roof (Canvas Or Metal) Were Optional Extras. In 1950, The Lights Moved From a Position Behind The Grille To Protruding Through The Grille. 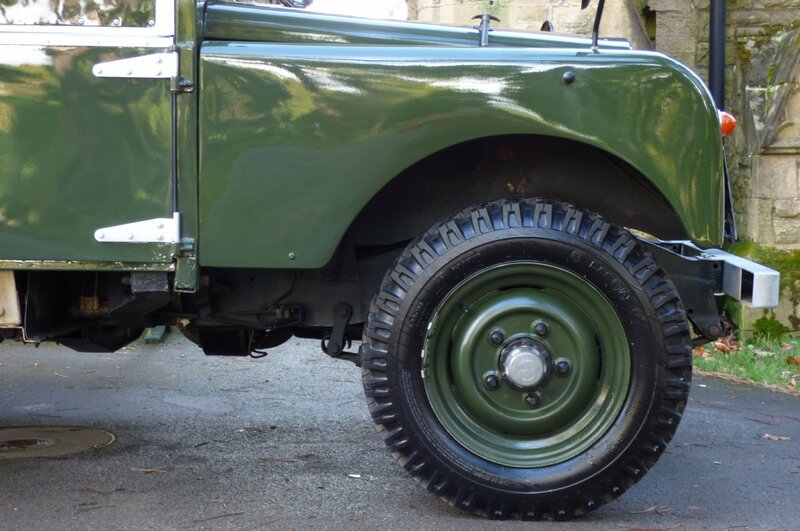 In Mid-1956 The Wheelbases Were Extended By 2 Inches (51 mm) To 88 Inches (2.24 m) And 109 Inches (2.77 m), And The Front Chassis Cross-Member Was Moved An Inch Forward, To Accommodate The New Diesel Engine, To Be An Option The Following Year. 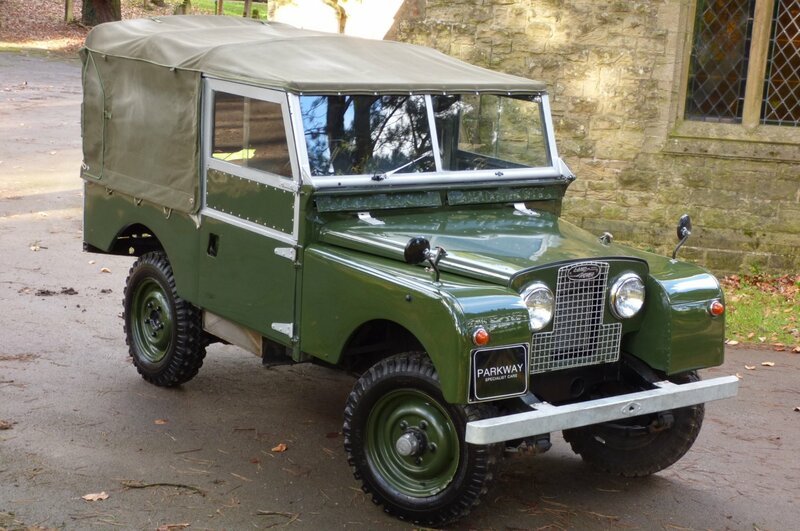 This Change Was Made To All Models With The Exception Of The 107 Station Wagon, Which Would Never Be Fitted With a Diesel Engine, And Would Eventually Be The Last Series I In Production. 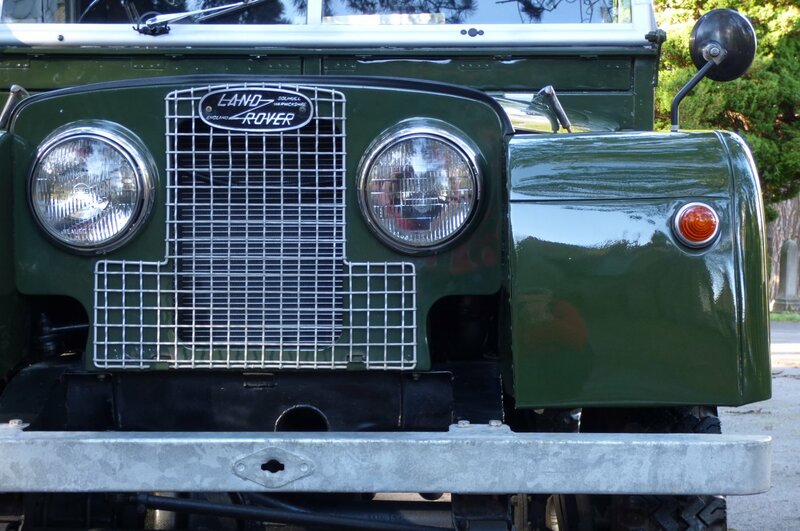 These Dimensions Were To Be Used On All Land Rovers For The Next 25 Years. 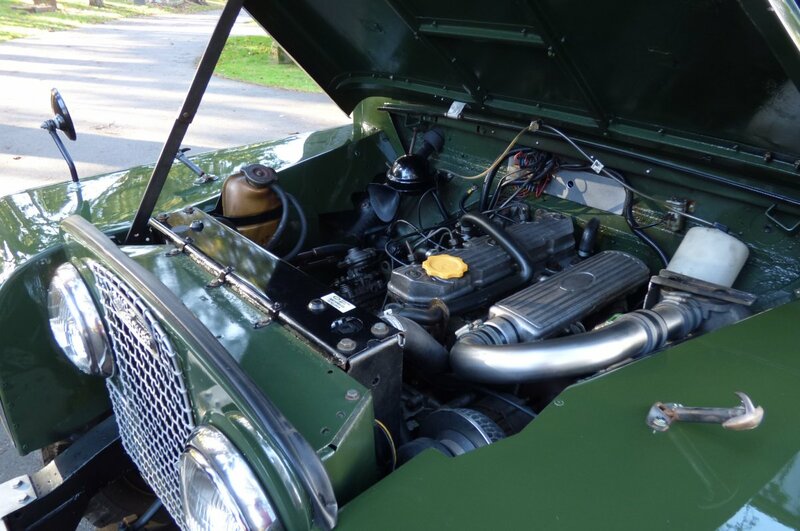 In 1957 a Brand New 2.0-Litre Diesel Engine Was Introduced That, Despite The Similar Capacity, Was Not Related To The Petrol Engines Used. 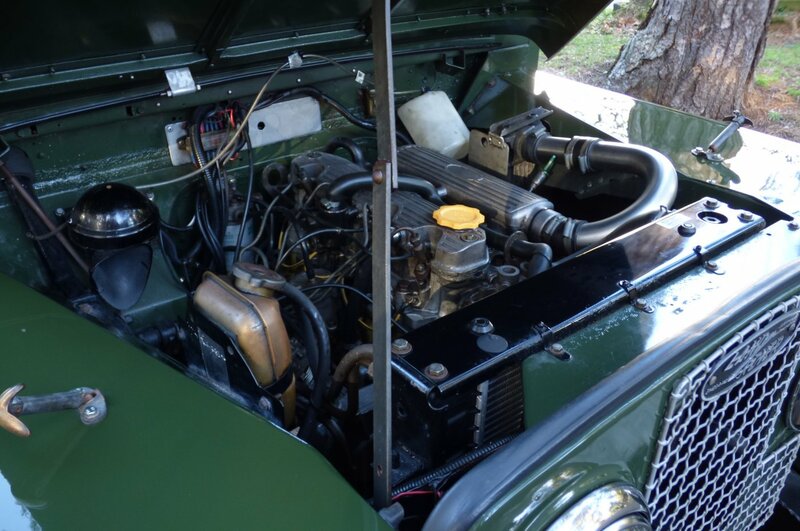 The Petrol Engines Of The Time Used The Rather Out-Dated Inlet-Over-Exhaust Valve Arrangement; The Diesel Used The More Modern Overhead Valve Layout. 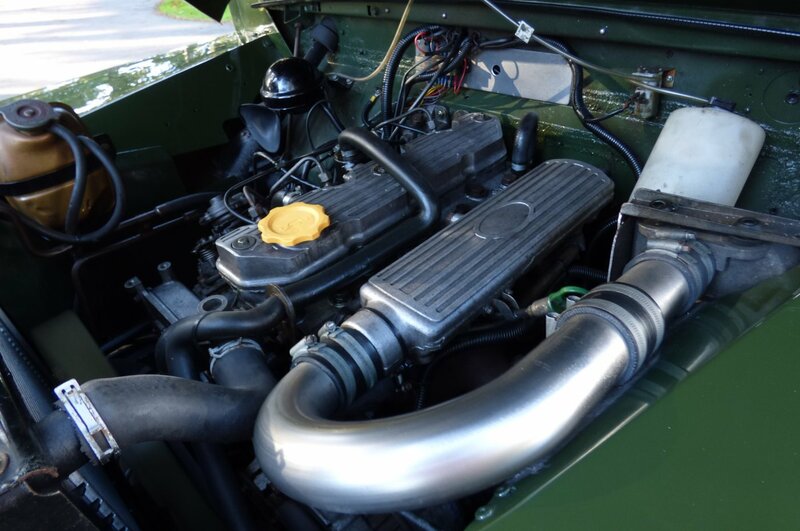 This Diesel Engine Was One Of The First High-Speed Diesels Developed For Road Use, Producing 52 hp (39 kW) at 4,000 rpm. 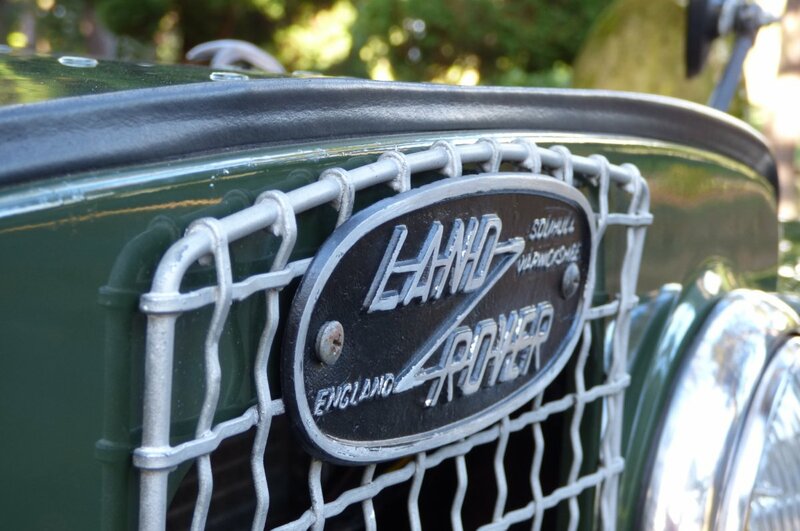 Land Rover Heritage At It's Finest. 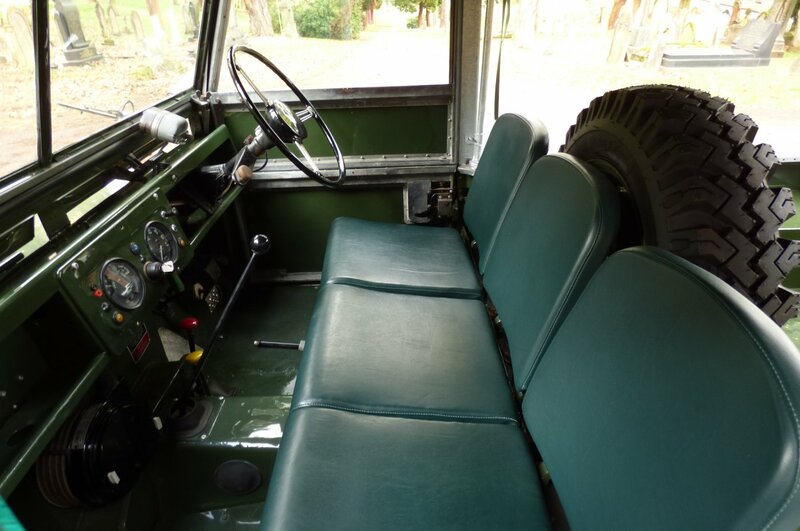 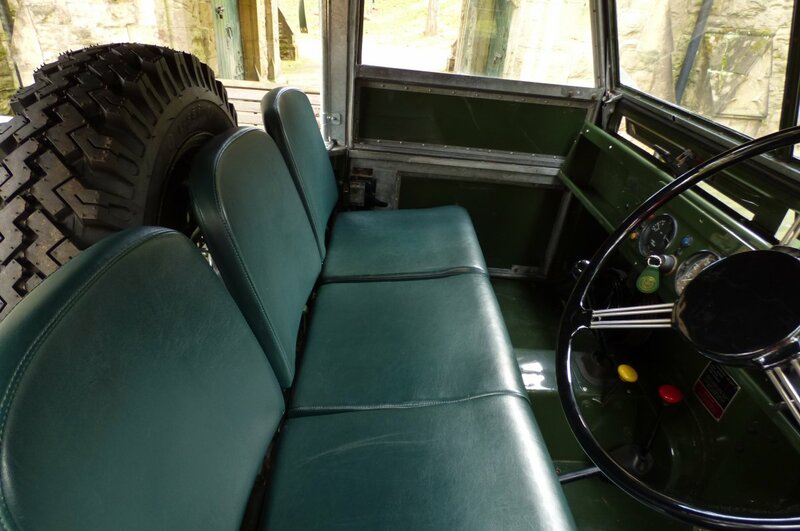 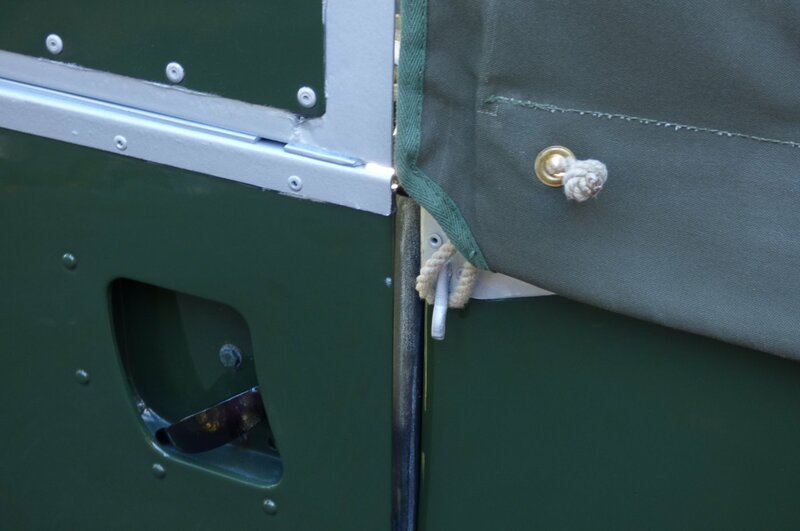 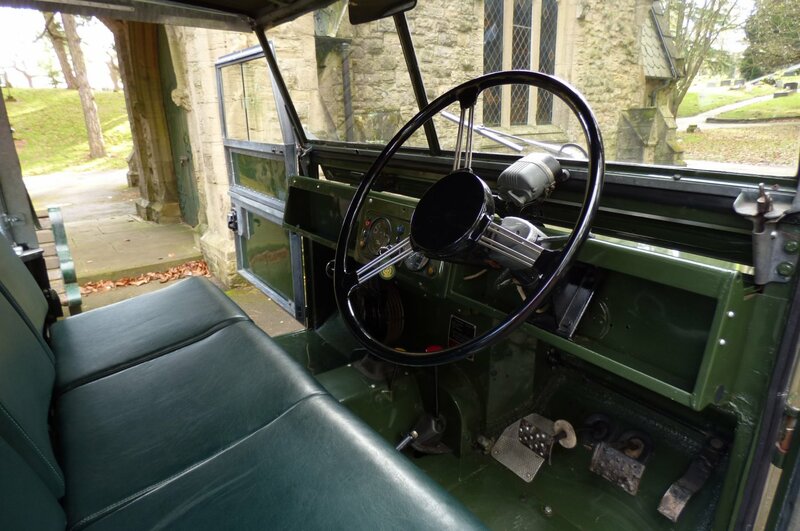 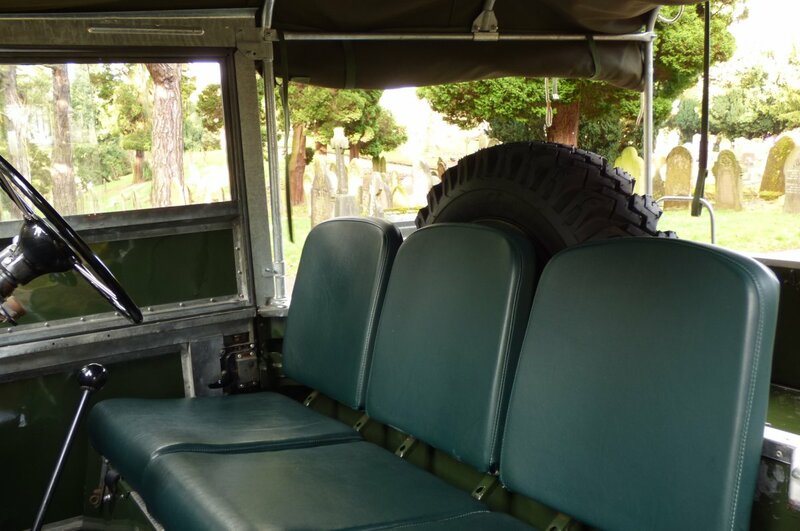 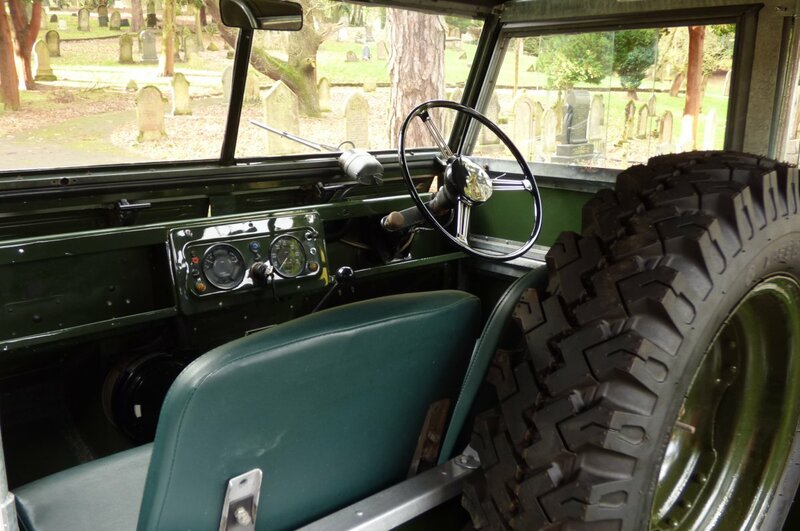 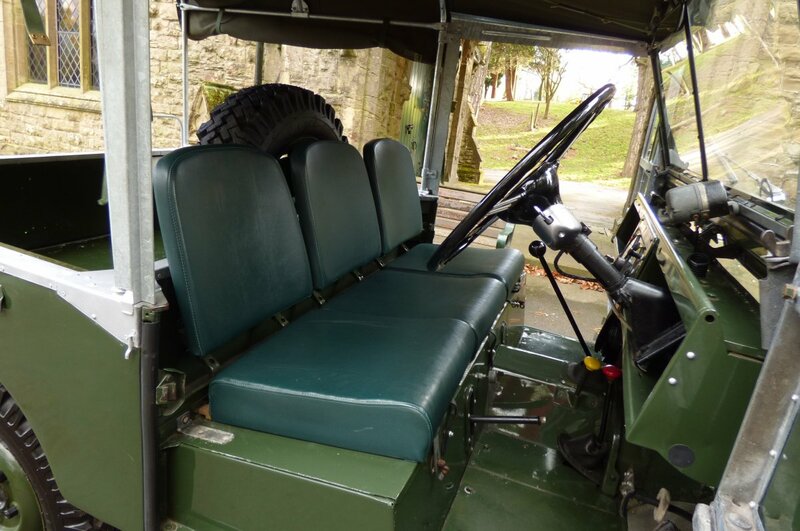 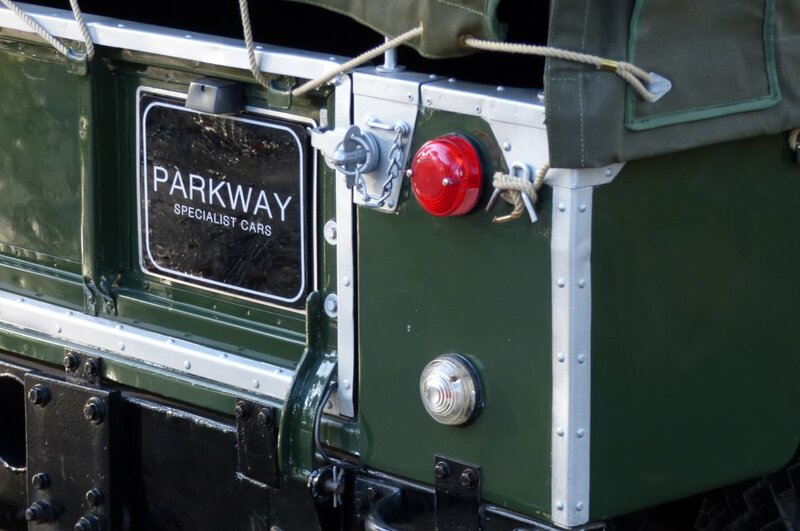 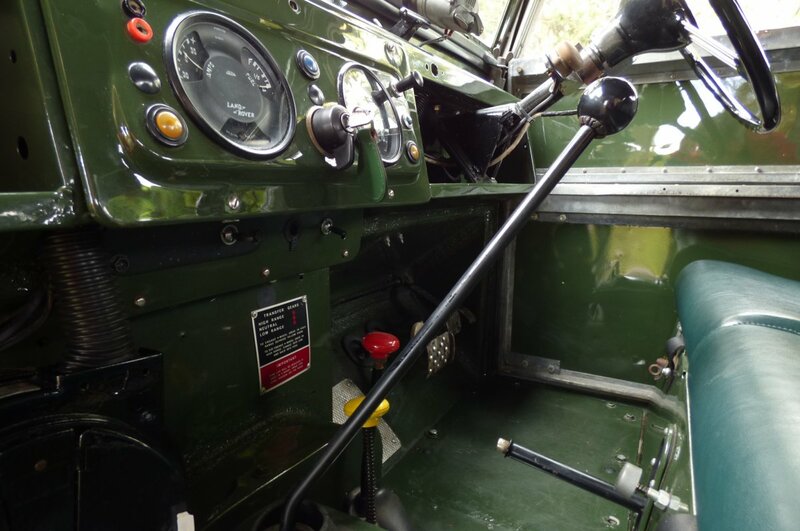 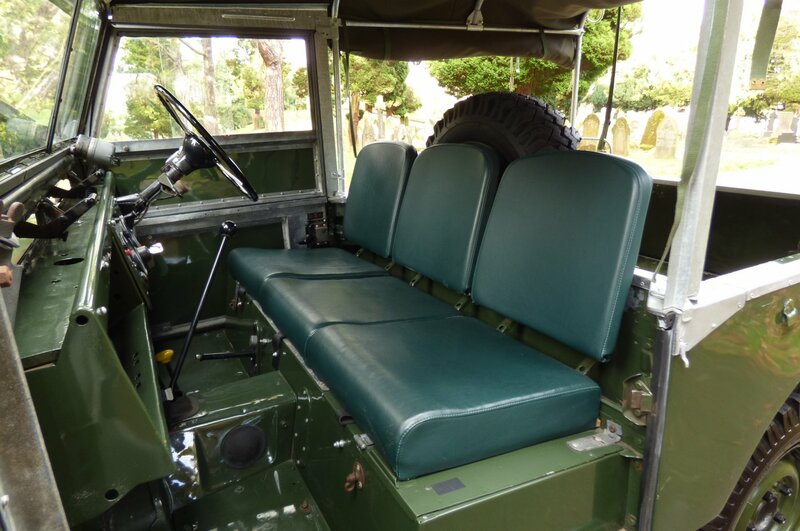 The Interior Of The Series 1 Has Been Totally Refurbished With The Benefit Of New Exmoor Green Square Style Seating, While Being In Superb Condition It Retains A Very Original Feel With A Beautiful Patina. 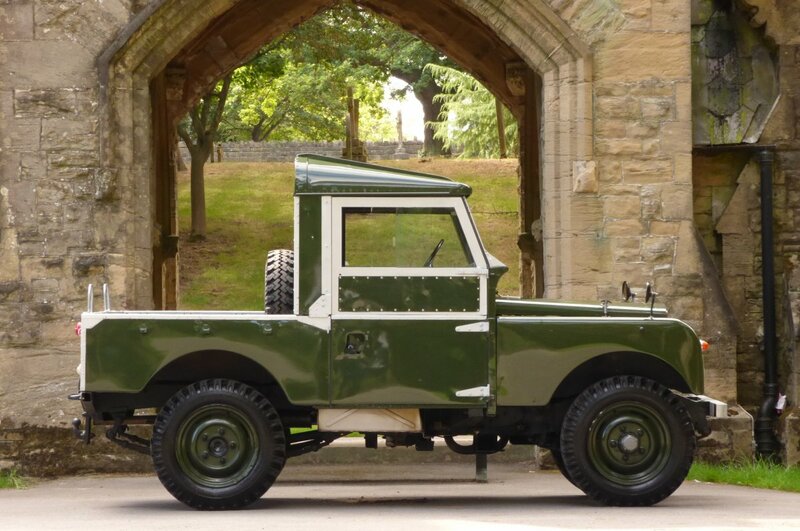 While Obviously Having A Very Utilitarian Feel It Has A Unique Charm That Represents Land Rover Through The Ages And With Long Term Ownership Will Offer Years Of Enjoyment And Could Be Passed Through The Generations. 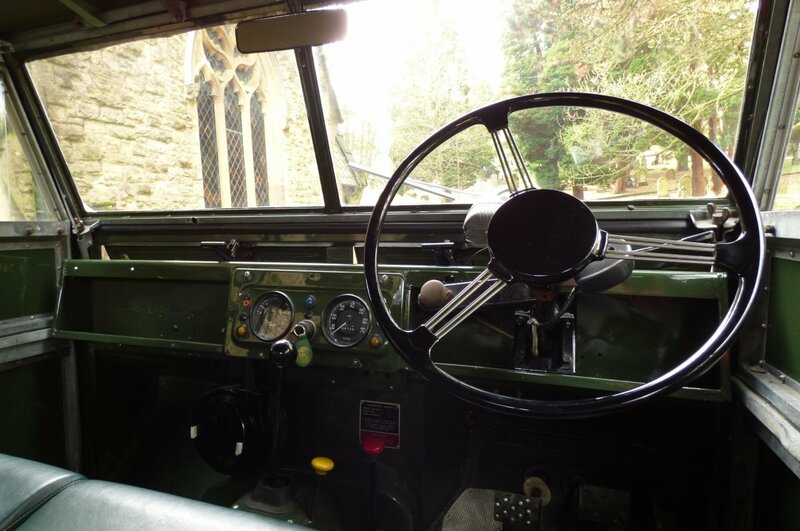 An Interior True To The Time. The Iconic Body Is Finished In Deep Bronze Green, Perfectly Showcasing The Signature Series 1 Lines And Finished With Colour Coded Wheels With Free Wheeling Hubs. 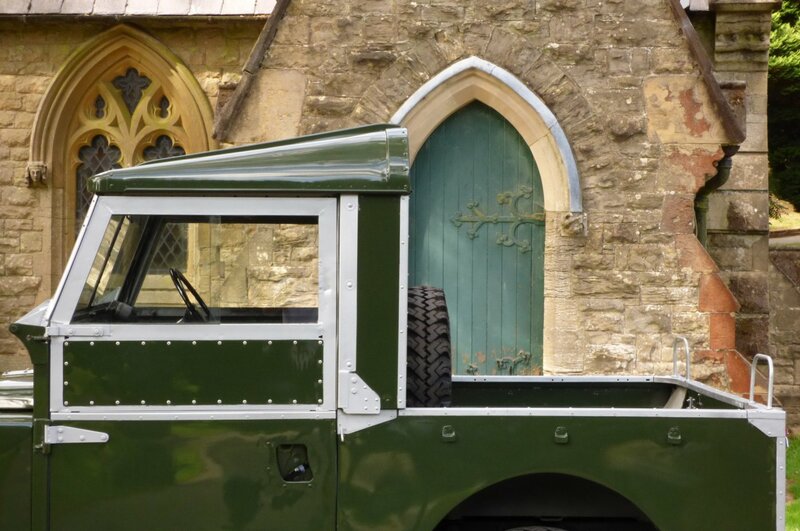 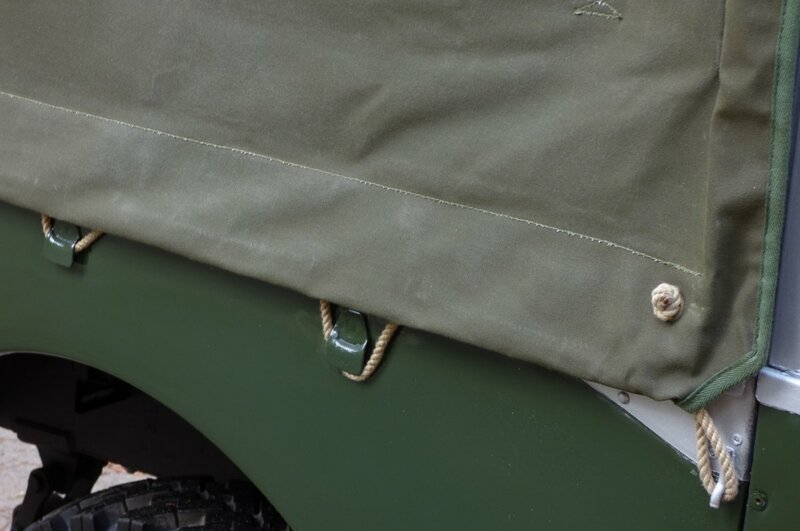 Benefiting From a Brand New Khaki Hood With No Side Windows, New Leather Straps And Grab Handles The Exterior Aesthetics are Timeless And Are Equally At Home In a Urban Environment Or a Country Pile.  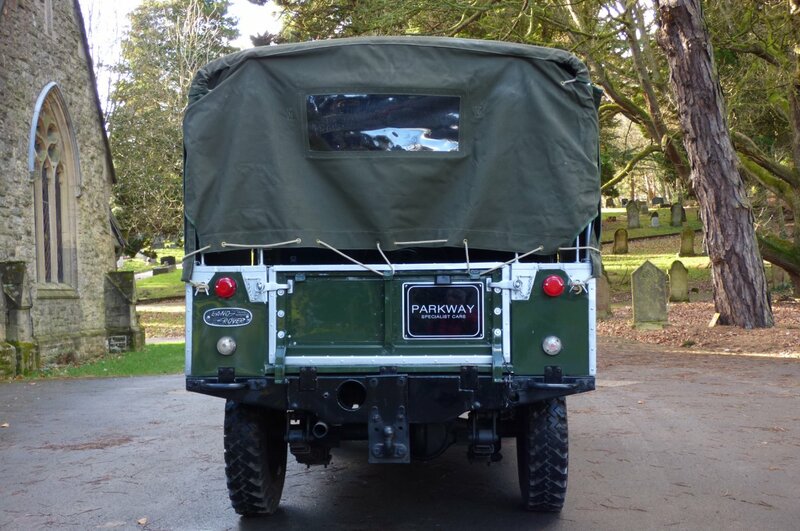 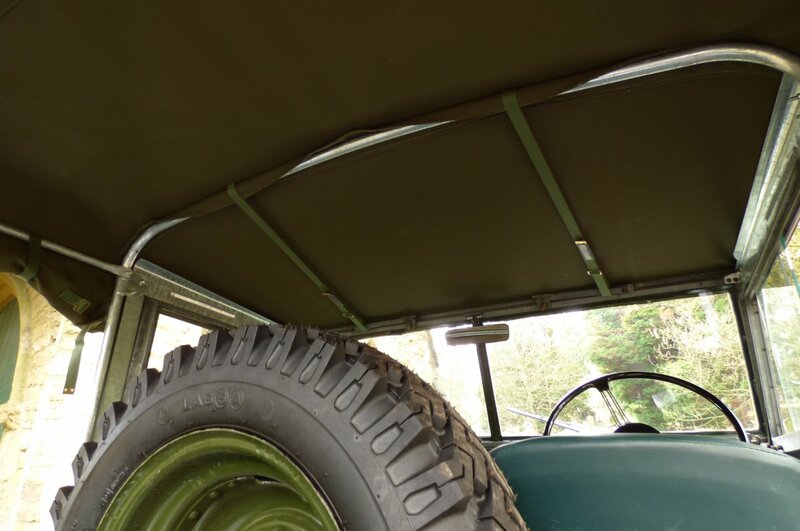 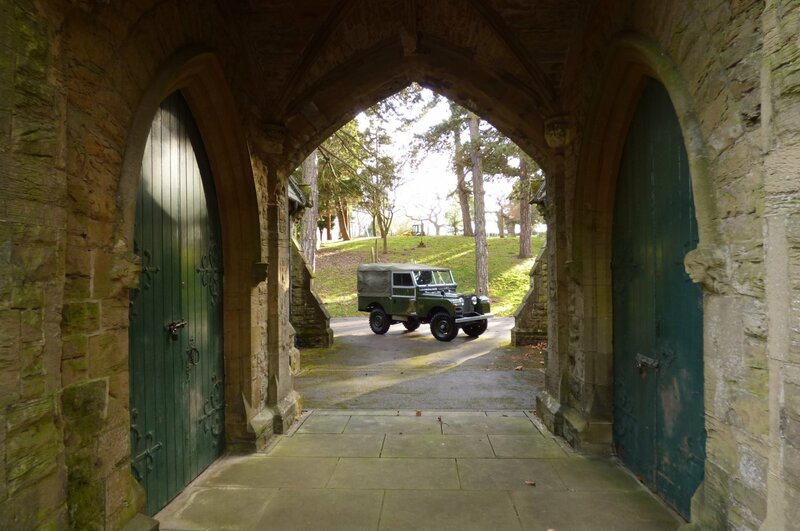 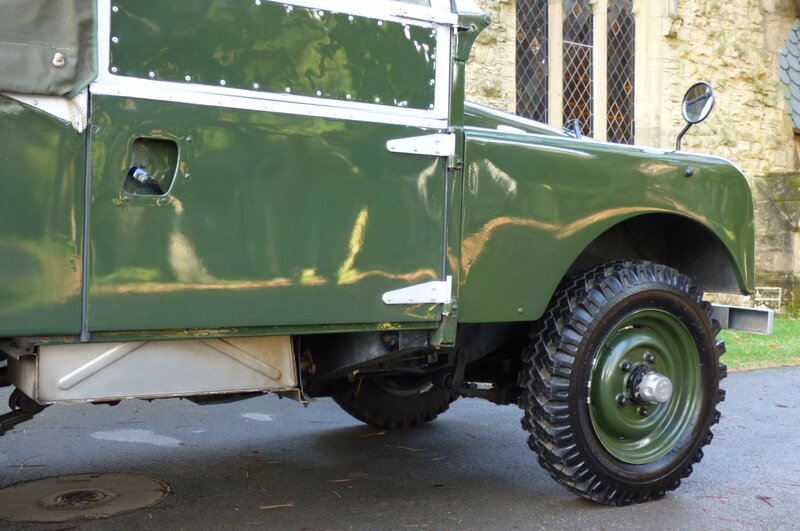 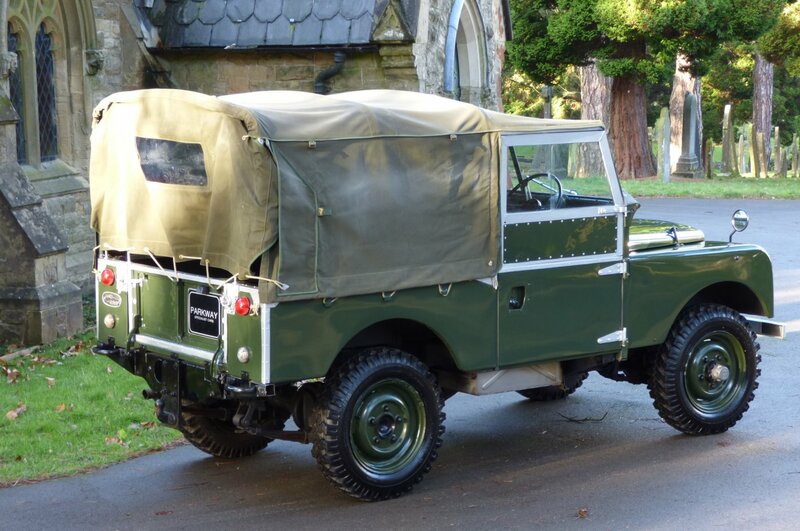 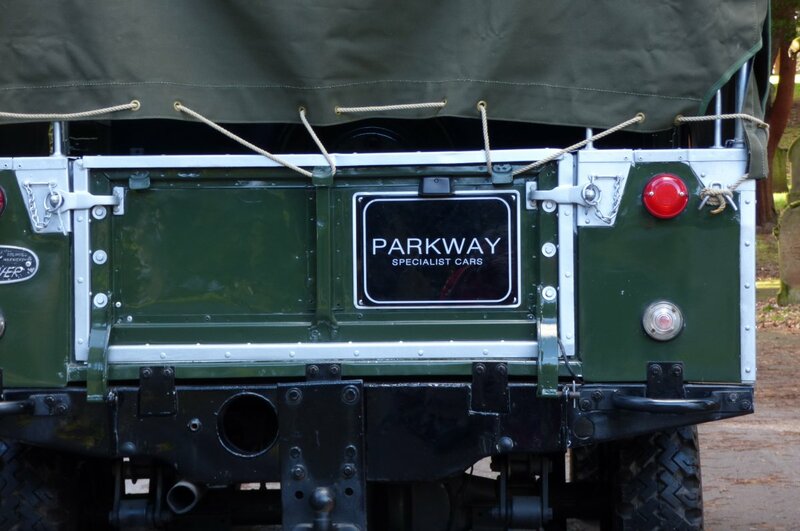 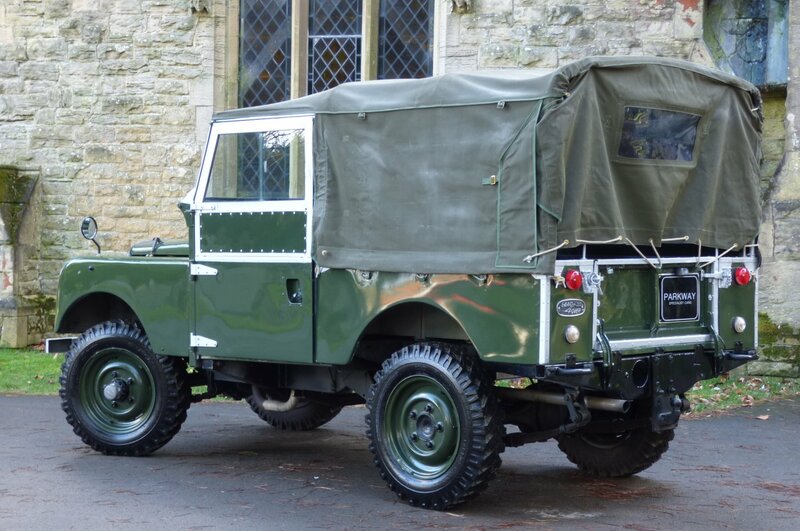 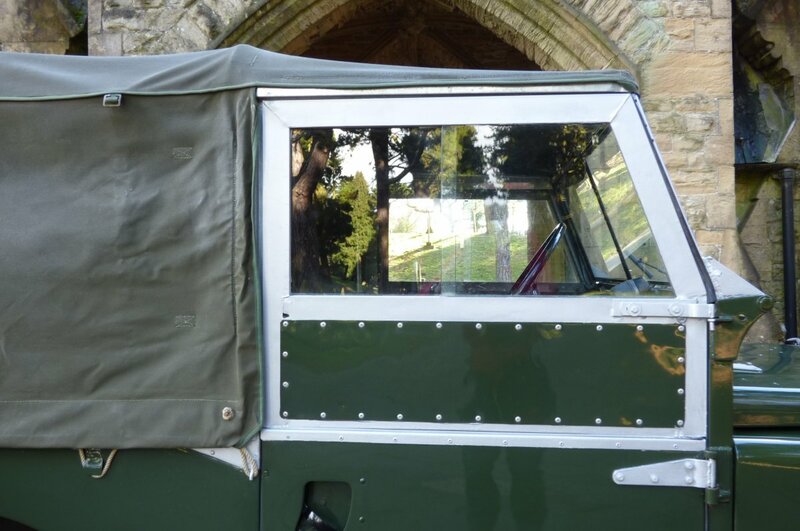 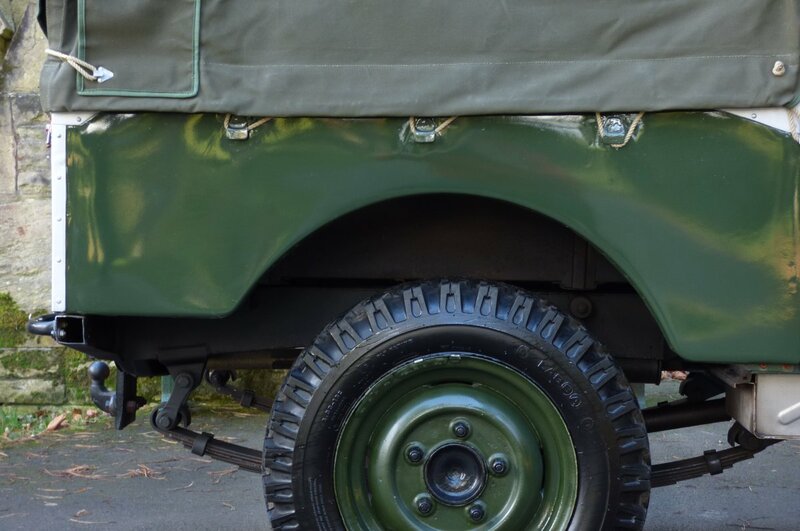 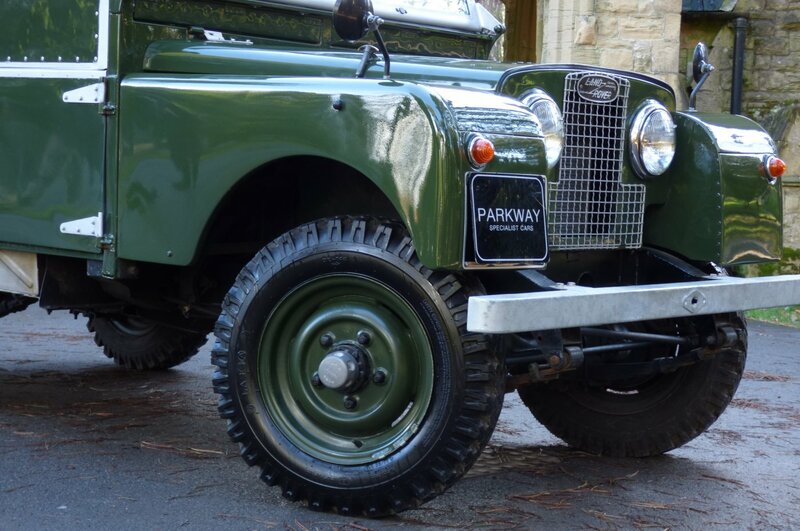 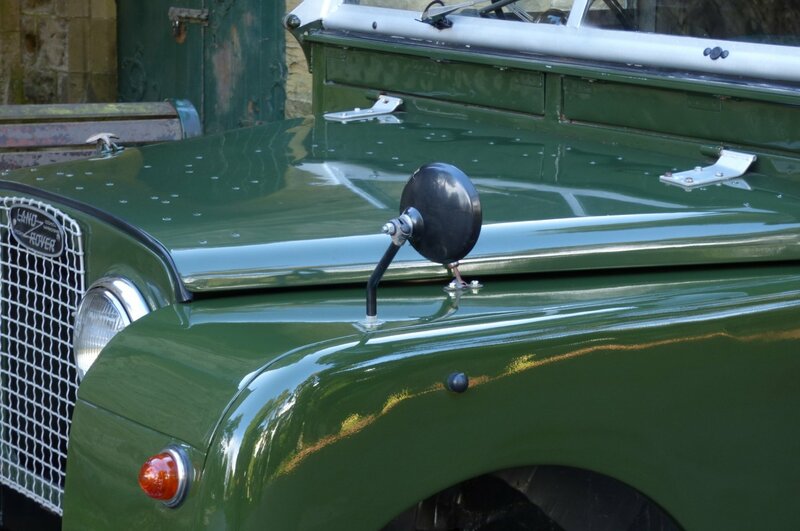 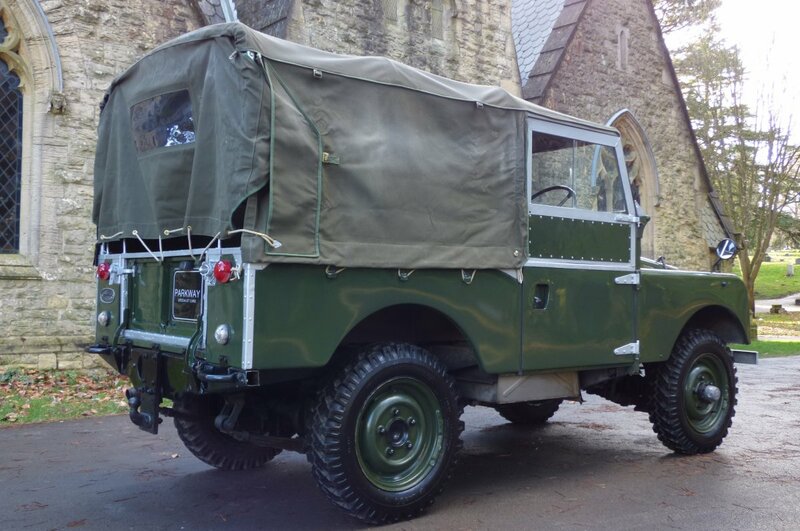 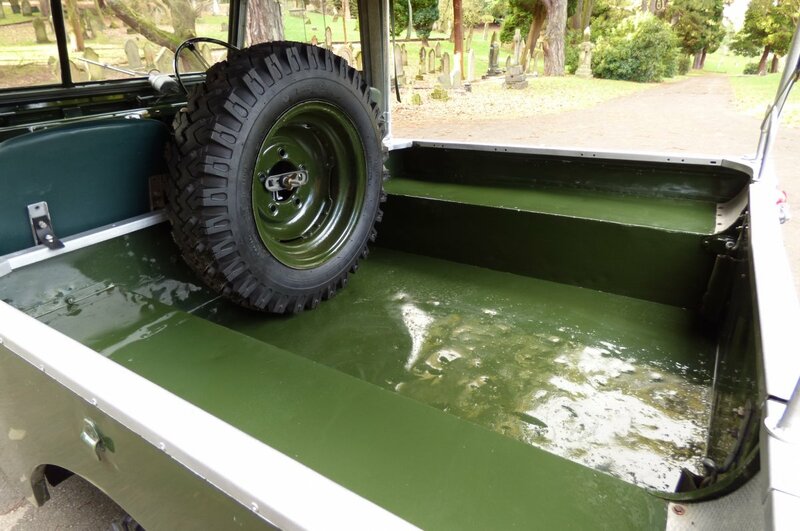 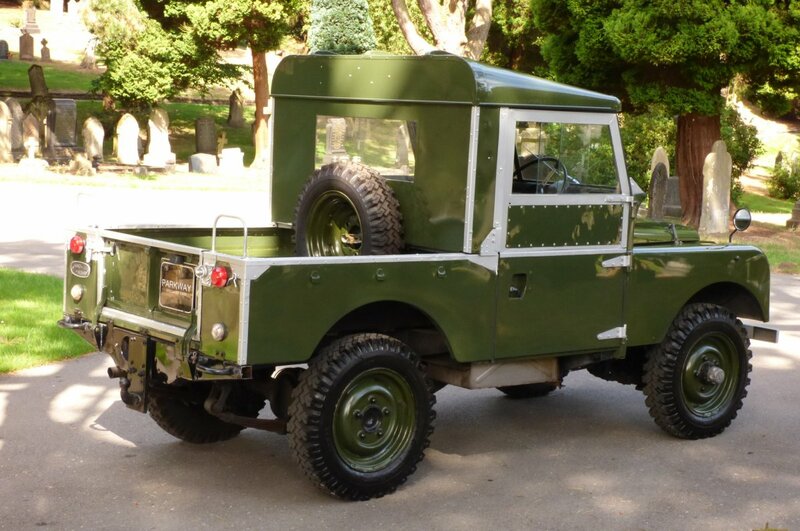 All Details On The Vehicles Exterior Have Been Refurbed Or Replaced And Now Will Make The Perfect Classic 4X4 To Form Part Of A Collection Or As A Real Summer Statement Vehicle.